- 20 % discount until 01 March 2016! - 15 % discount until 01 June 2016! Sunset Kosharitsa is a newly built gated holiday complex, located at the last foot-hills of the Stara Planina mountain, just 6 km away from sandy beaches of the biggest Bulgarian Black Sea resort Sunny Beach and the smaller resort towns of Nessebar, Sveti Vlas and Pomorie. This unique vacation retreat provides tranquil ambience, quietness and rural atmosphere to be appreciated by those looking for a real relaxation, away from the hustle and bustle of the busy commercial resorts. Sunset Kosharitsa has great on-site facilities (see more details below) in combination with unspolied natural beauty, which will turn your family holiday into a very special experience. 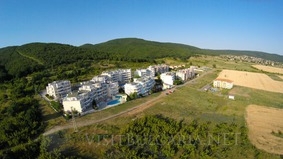 Location: Some 6 km away from the sandy beaches of Sunny Beach resort. Just 100 meters from Kosharitsa village and next to an oak forest, covering the southern hills of the mountain. Great views towards the Sea and the Bay of Nessebar and Sunny Beach. The popular resorts around with all their busy night life, restaurants and beaches are easily reachable by own car, taxi or the shuttle bus of the complex, are just few minutes drive. The international airport of Bourgas is some half hour away on a nice road, by car or by regular public transport with stops at the resorts around. The nearby village of Kosharitsa is a popular holiday area among the locals who own villas and holiday homes here. There are also some food shops and small restaurants offering local cuisine and affordable prices. Accommodation: Sunset Kosharitsa comprises of few apartment buildings with studios, one-bedroom and two-bedroom apartments. All properties are fully furnished and equipped to the highest standards offering cosy and spacious home atmosphere in combination with full cooking facilities (oven, cookers, microwave, fridge, toaster). All apartments have cable television with local and international channels, internet connection, DVD/MP3 player and air-conditioning. All bedding and linen are included as well. Cleaning and change of linen is provided on every three days as standard or daily against a little additional charge. Facilities at the complex: This modern holiday complex has great on-site facilities which will make your holiday the most pleasant experience. All guests can choose between 5 swimming pools, pool-bars, sauna, Jacuzzi, steam-room, gym and massage. There is also a mini-market shop selling food and drinks at most affordable prices. The "Kosharitsa" Bar & Restaurant offers delicious meals from the local and international cuisine at reasonable prices. Landscaped gardens with flowers and trees, car parking, conference hall for 150 persons are among the list of amenities available to the holiday makers. Most of the apartments have panoramic balconies affording breath-taking views to the sea coast of Sunny Beach and Nessebar where you can have your morning coffee or relaxing evenings with glass of wine. The oak-forest bordering the complex and the mountain hills around offer great opportunities for walking tours, picnics or mountain biking. A regular shuttle bus service to Sunny Beach and back is available to the guests 4 times a day against small charge. Also, there is a public bus transport to Sunny Beach during the whole day. You will not miss anything in Sunset Kosharitsa. All major attractions are within minutes driving. The young and friendly staff running the complex will meet and greet you as a special friend, giving their very best for your pleasant stay. If the price is also important to you, then you have to know that Sunset Kosharitsa offers the best value for money in the whole area of Sunny beach. "Kosharitsa" Bar & Restaurant is located at the complex. It has an open-air terrace and offers pleasant ambience together with delicious specialties of the Bulgarian and International cuisine, various drinks, cockatails. Also vegetarian meals and healthy food. The choice is great at "Kosharitsa" Bar & Restaurant and the prices are very reasonable. Therefore guests can eat delicious food at the restaurant during their whole stay and still not spend much money.